Luigi sat on the wooden dock and watched Angelo row over the waves. As each splashed on the beach, Luigi watched sticks, sea glass and pieces of plastic roll onto the sand. The seagulls squawked as they flew overhead and men in big boats unloaded huge baskets of fish. Luigi looked up at the beehive. When he walked underneath it, the bees rushed towards him. One stung him on his bottom. Luigi kicked his back legs high into the air, braying with pain. Fish flew out of the basket and bees swarmed all over them. Angelo gasped. “No! Luigi! 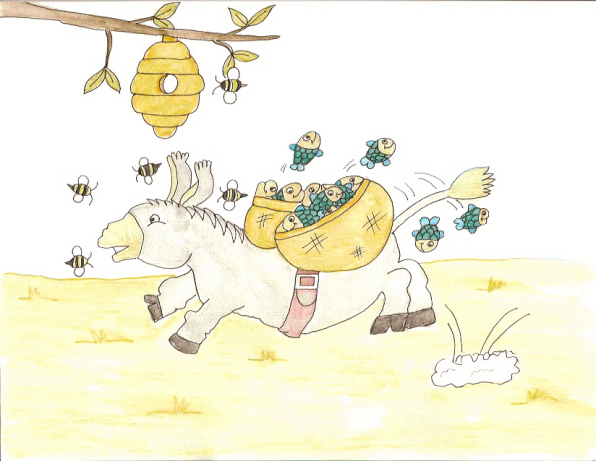 The fish!” He grabbed the donkey by its nose and pulled it away from the bees. Several fish lay scattered on the ground. “Oh, Luigi. That is less fish to sell. You might not get any oats for supper tonight.” He stroked the donkey's face. When he went back to see if he could save the fallen fish, the bees chased him back to Luigi. Angelo handed his wife several fish and then he and Luigi went to Maria's house. They gave her six fish. She gave Angelo some money and then handed him a loaf of hot bread. When they went to Consuelo's house, she paid Angelo and gave him a bag of oats. That night Angelo and Carmalita feasted on fried fish with lemon sauce, pasta and hot bread. Luigi ate the oats and thought about how tomorrow when they went fishing, they were taking another path, away from the bees. He'd had enough flying fish!